A world of inspiration & artistic fulfillment. Set of 4 softcover 8-1/4” x 11” coloring books. Pages are perforated and printed on one side only for easy removal and display. Each book features 31 illustrations that are specially designed for experienced colorists, and offer an escape into a world of inspiration and artistic fulfillment. Each title is also an effective and fun-filled way to relax and reduce stress. Spring Scenes: Let your creativity spring to life with illustrations that celebrate the most colorful season of the year. 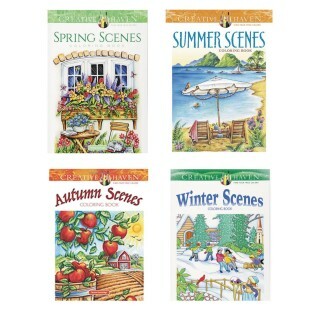 Wonderfully detailed scenes are set in both the country and city and are filled with gorgeous flowers in full bloom, gardening accessories, chirping birds, well-decorated homes, and more. Creative Haven Summer Scenes: Charming summer scenes will delight colorists yearning for sunshine every day of the year! Detailed original designs include seascapes, gardens in bloom, and idyllic farm vistas as well as romantic picnics, sunsets, and a wedding on the beach. Creative Haven Autumn Scenes: Beautifully rendered scenes evoke the sights, sounds, and even the smells of autumn. From falling leaves and Halloween decorations to an abundant cornucopia and a festive Thanksgiving collage, these amazingly detailed images celebrate one of the most colorful seasons. Creative Haven Winter Scenes: This adult coloring book of charming winter scenes will warm your heart! All-original designs include young children gazing out of frosty windows and building snowmen, lovely snow-covered villages, wild animals roaming icy landscapes, horse-drawn sleds, and more.